Senator Pat Dodson has said, as further allegations of abuses emerged in Queensland. Mick Gooda, the Aboriginal and Torres Strait Islander social justice commissioner, addressed Garma shortly after and said the royal commission must confirm the reality “that race really does play a role”. Speaking to ABC Insiders from the Garma festival in north-east Arnhem Land, Dodson said the royal commission, announced off the back of national outrage at abuses inside Darwin’s Don Dale detention centre, must be salvaged. Dodson’s call echoed that of the opposition leader, Bill Shorten, on Saturday. On Sunday, the Labor leader appeared at Garma festival and urged Australia to convert the “national nightmare into a national turning point”. It comes as allegations of violence against children in a juvenile detention centre in Queensland sparked calls for the royal commission to broaden its focus. The commission attracted criticism almost immediately after its terms of reference and lead commissioner were announced, with claims that Indigenous groups were not consulted and some suggesting that the fact the commissioner Brian Ross Martin, a former NT supreme court judge, may have sentenced some of the prisoners at Don Dale may give the impression he is not independent. Dodson called for Indigenous co-commissioners to be appointed and said “there has to be Aboriginal participation” in the royal commission. Dodson said the Northern Territory government should be subpoenaed to give evidence and that the chief minister, Adam Giles, had shown himself to be incompetent. Footage of teargas, spithoods and restraint chairs being used on children – aired on Four Corners on Monday night – has galvanised public opinion and led the prime minister, Malcolm Turnbull, to announce the royal commission hours after its broadcast. Dodson said it would be hard for the boys featured on last week’s Four Corners program to face the future with the scars of what was done to them, and said it might have been different today if Australia had paid attention to the recommendations of the royal commission into Aboriginal deaths in custody 25 years ago. He called for Australia to adopt the UN optional convention on torture so people in detention could be protected from vindictive governments and policies. “Australia is shocked by the level of violence us Aboriginal people almost take for granted,” Gooda said. He said Indigenous leaders had met this weekend to discuss the need to shine a light on institutions like detention facilities which by their nature were closed and secretive. “What we have seen is in part the consequences of people feeling their conduct is not under scrutiny, not required to meet the standards and that they will not be held accountable for their actions. This must change,” he said. Giles and the governing Country Liberal party may face defeat at the Northern Territory election next month. Dodson said it would be “an absolute travesty” if Giles one day became a federal senator for the NT. “These scandals have been reported, have been litigated, but there’s no mistaking the power of that image on the television,” he said. What happened next mattered a great deal and unless Indigenous people were part of the conversation Australia would make the same mistakes it had for the last 200 years,” he said. Shorten also pointed to failings in the wider justice sector, and said Labor would be looking at the changes which needed to be made including solutions already repeatedly put forward by reviews and inquiries. Shorten said nothing held the royal commission back “from the heart of the matter” and that the terms of reference would allow examination of the whole youth justice sector in the Northern Territory. 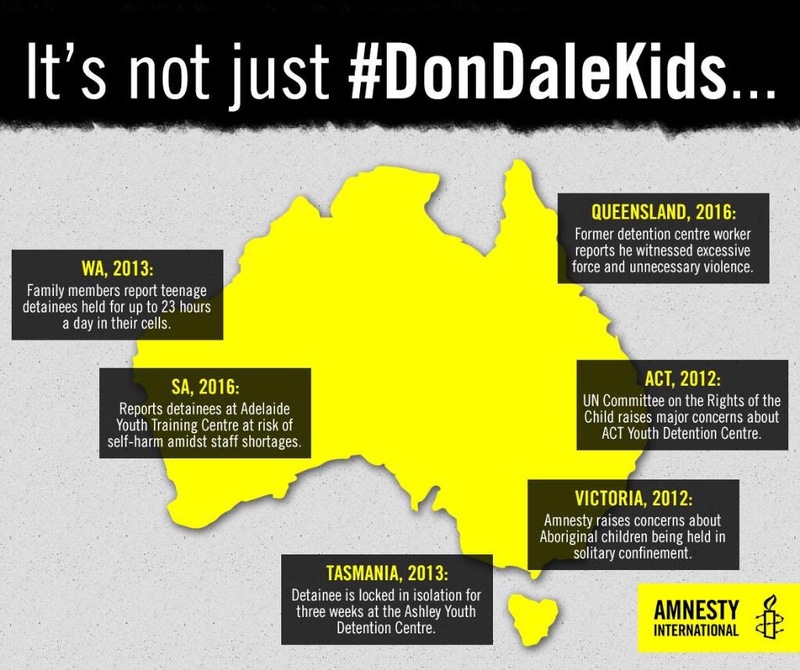 Several former youth workers at the Cleveland youth detention centre in Townsville in far north Queensland have told of further allegations of physical and emotional abuse of detainees, some as young as 12. The most recent allegations were made in a special episode of Lateline examining juvenile justice on Friday night, sparked by the ABC’s investigation last week. Shayleen Solomon, who worked at the Cleveland centre for almost six years from 2009 said she was not surprised by Four Corners’ revelations about “smashing the boys and that type of brutal behaviour”. Solomon told Lateline of an incident at the Cleveland centre in 2012 when 15 men allegedly equipped with “crash pads, which are almost like rugby league tackle pads”, physically subdued a 15-year-old boy who talked back at them. Solomon said the boy was headbutting the ground, and that she put her hands underneath his bleeding forehead to stop him from hurting himself more. Solomon said racism was an issue within the centre, with the prison population never dropping below 95% Indigenous Australians and tending towards 98% or 99%. Other former workers at the Cleveland centre have told of the use of excessive violence against children, and called for Queensland to be included in the upcoming royal commission into juvenile detention. Graham Pattel and Jeff Ingram, both former youth workers, told the ABC they had witnessed violence against children – some of whom, Pattel said, were just 12 years old. Both men had been sacked from Cleveland, which they claimed was related to their complaining about the treatment of detainees in the centre. But Turnbull has resisted calls for the scope of the royal commission to be broadened to include systems in other states and territories. He told a Cairns radio station on Wednesday that royal commissions were “most effective when their terms of reference are clear and focused” and this one would focus exclusively on the Northern Territory.